Patrick Burke – Hang your head in shame!! My blood ran cold when I learnt of this outrageous insult to the memory of Lee Rigby and regardless of his age , Mr Burke has gone to far and should be ashamed of himself. If it wasn’t for Lee and others like him our world would be a lot less safer and I for one am eternally grateful for their service and sacrifice. A sick vandal who ransacked a memorial to Fusilier Lee Rigby just days before the fourth anniversary of his murder got away with a £105 fine. Patrick Burke, 66, binned several flags and tributes during a destructive rampage at the monument, which marks the spot where the soldier, 25, was butchered by two terrorists. During the incident a teddy bear left by Lee’s six-year-old son, Jack, was pulled down and thrown over a nearby wall, Bromley Magistrates Court heard today. 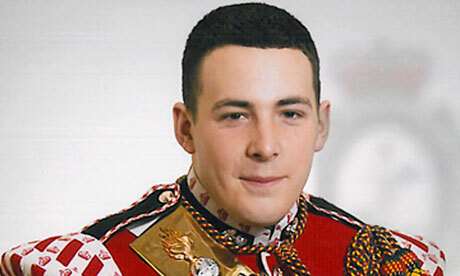 Burke was caught on CCTV targeting the display outside the Royal Artillery Barracks in Woolwich on May 22, 2013. Burke’s defence solicitor Emma Sackville said the pensioner didn’t think it was ‘appropriate’ to have the memorial outside his block of flats. Michael Adebowale, 25, and Michael Adebolajo, 32, were jailed for 45 years and life respectively for killing the off-duty soldier near his barracks. The pair knocked him down with a car before hacking him to death with a meat cleaver and knives in an attack that shocked the world. Ms Sackville told Bromley Magistrates’ Court today that Burke had pleaded guilty at ‘the first opportunity’. A Hero who died serving his Country! She said: ‘He did not mean any disrespect to Lee Rigby by his actions. ‘There is a memorial in a church nearby which is 700 metres away and Mr Burke’s view is that this is a more appropriate place for tributes to be left.